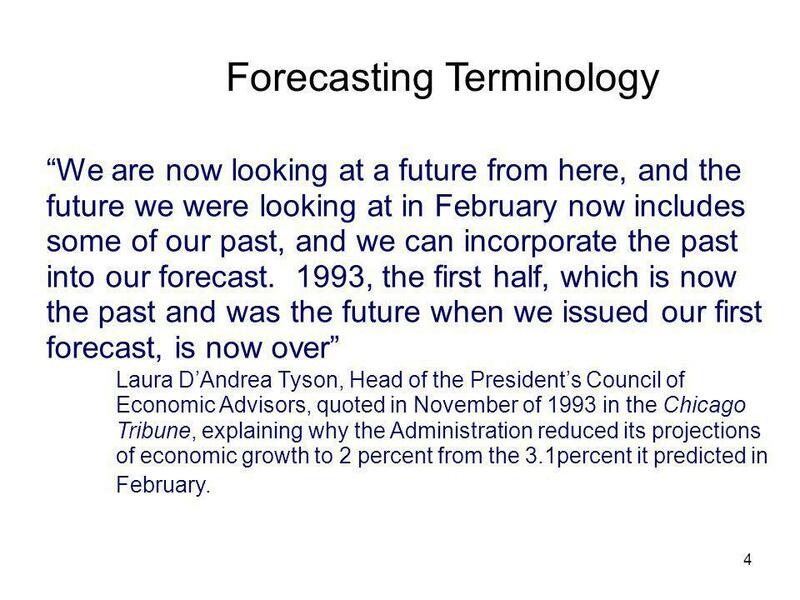 “We are now looking at a future from here, and the future we were looking at in February now includes some of our past, and we can incorporate the past into our forecast , the first half, which is now the past and was the future when we issued our first forecast, is now over” Laura D’Andrea Tyson, Head of the President’s Council of Economic Advisors, quoted in November of 1993 in the Chicago Tribune, explaining why the Administration reduced its projections of economic growth to 2 percent from the 3.1percent it predicted in February. 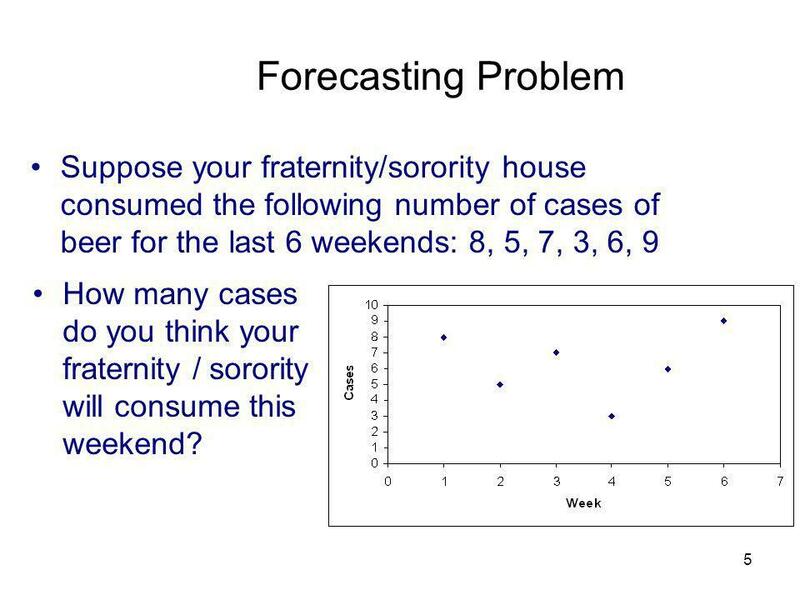 5 Forecasting Problem Suppose your fraternity/sorority house consumed the following number of cases of beer for the last 6 weekends: 8, 5, 7, 3, 6, 9 How many cases do you think your fraternity / sorority will consume this weekend? 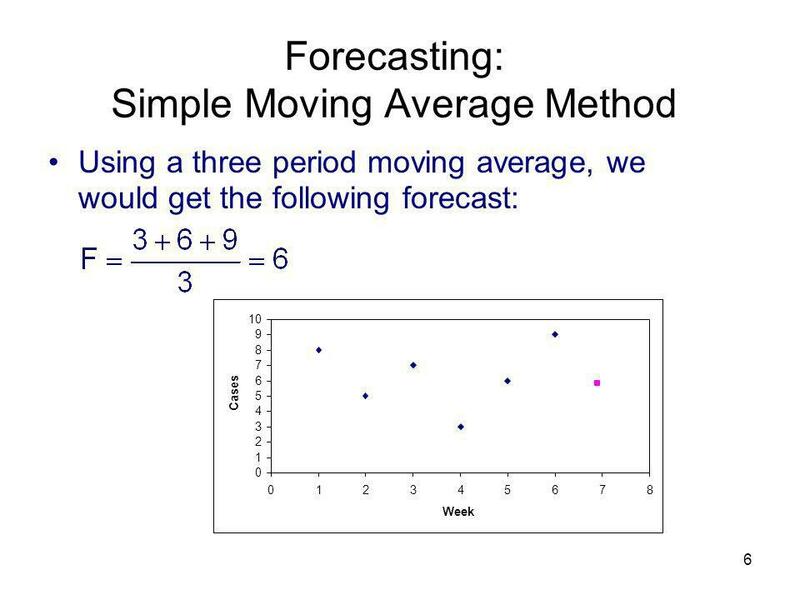 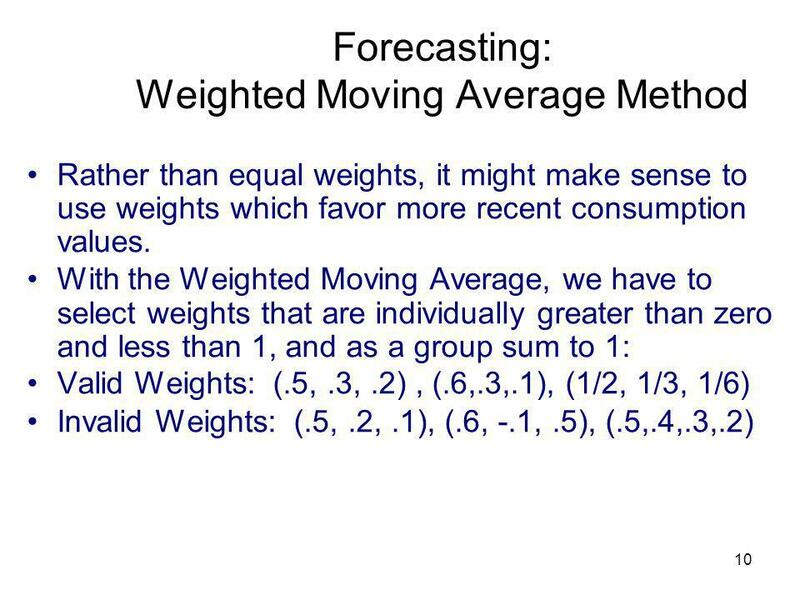 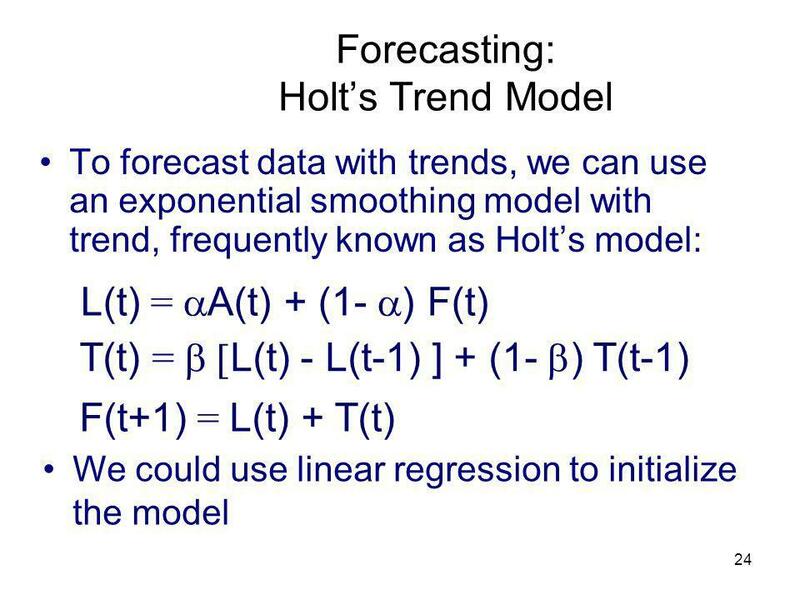 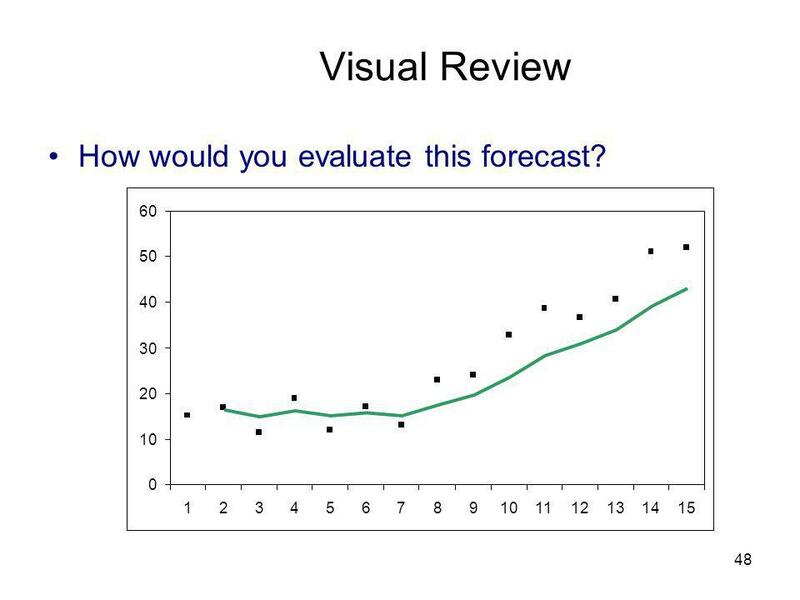 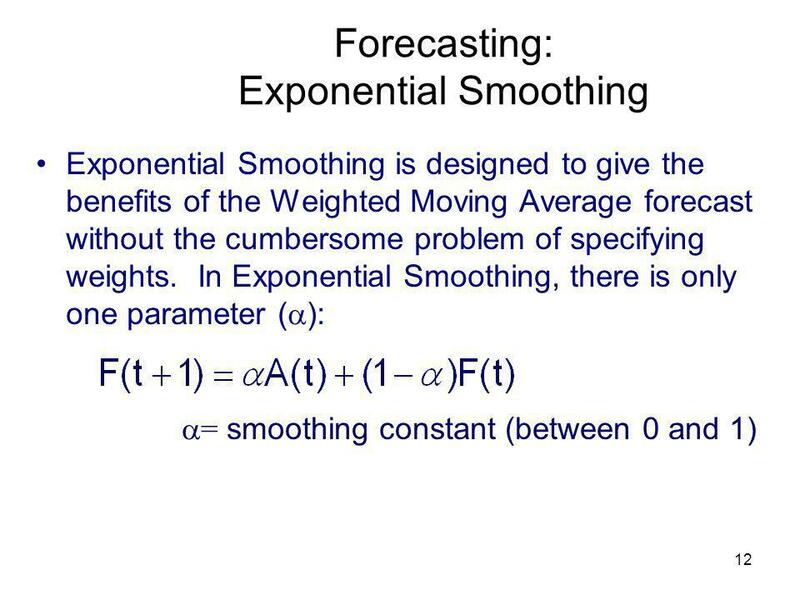 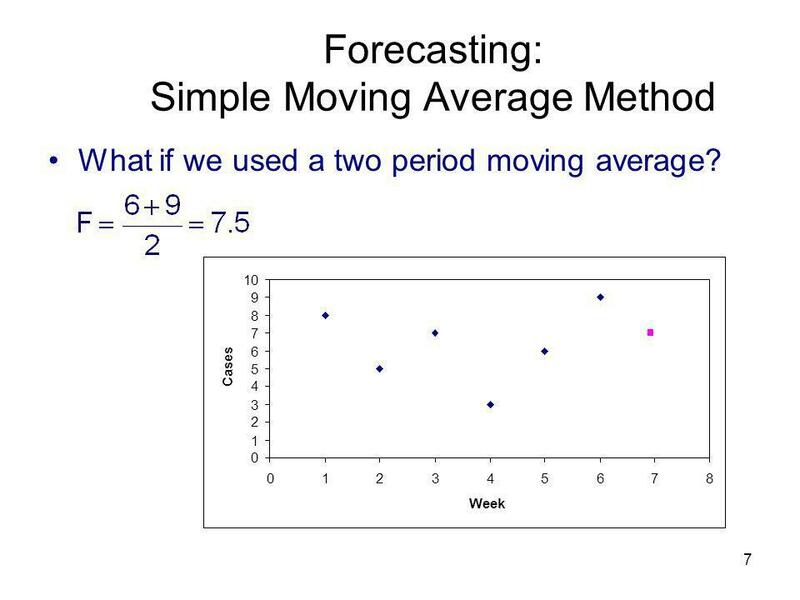 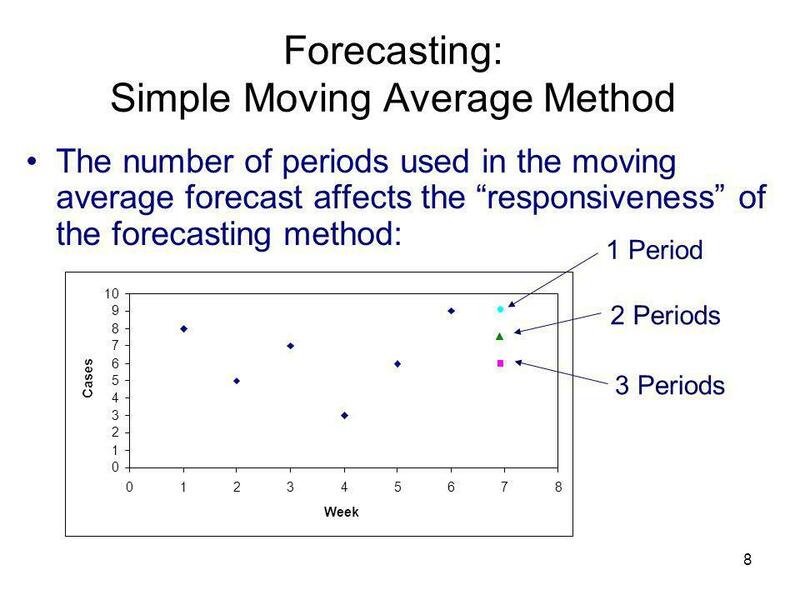 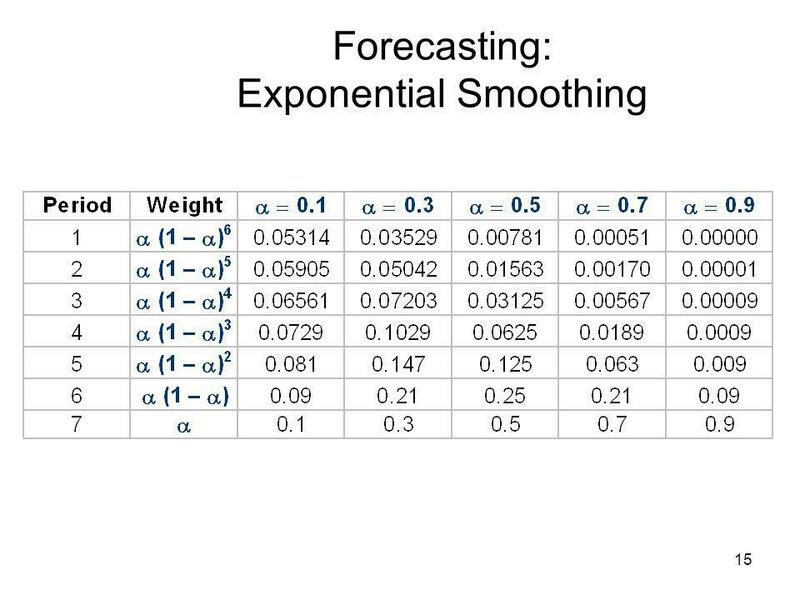 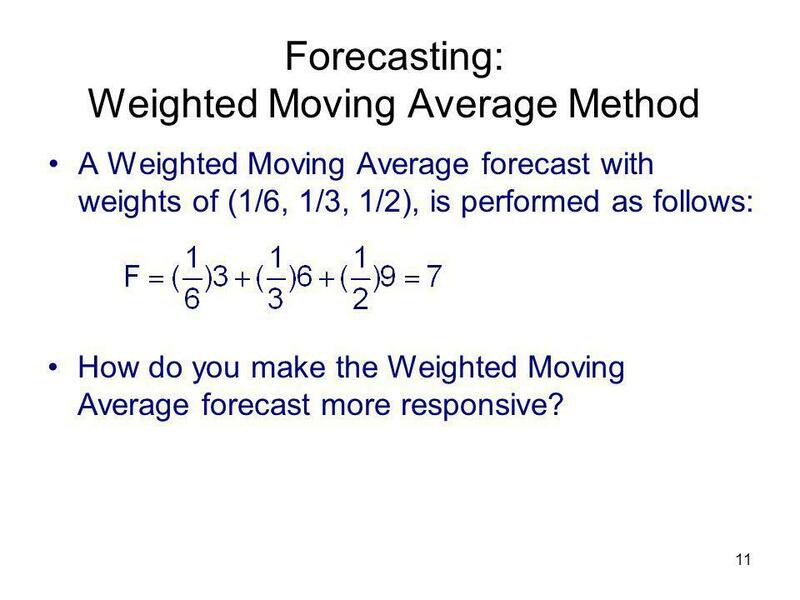 A Weighted Moving Average forecast with weights of (1/6, 1/3, 1/2), is performed as follows: How do you make the Weighted Moving Average forecast more responsive? 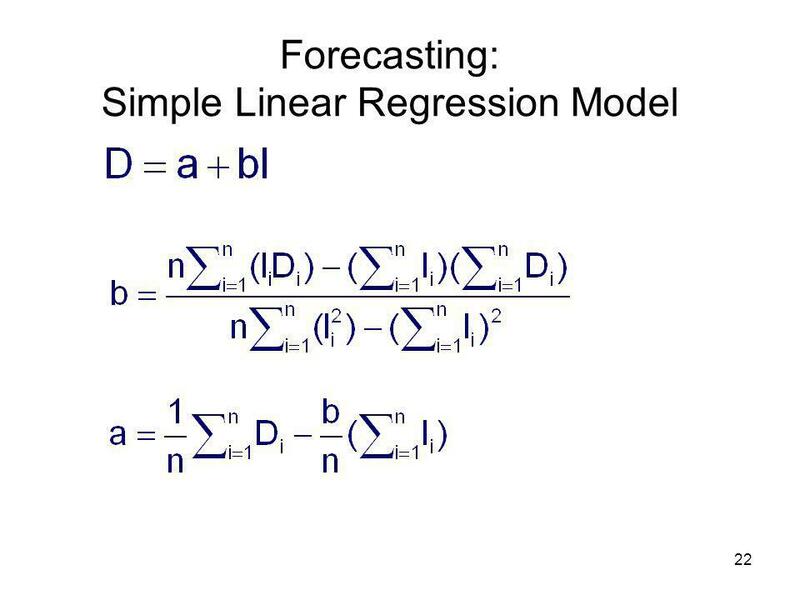 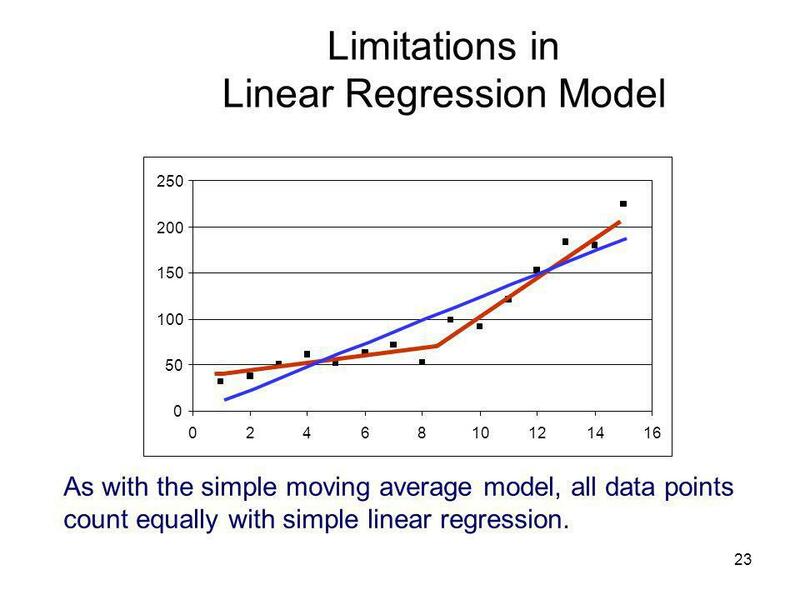 50 100 150 200 250 2 4 6 8 10 12 14 16 As with the simple moving average model, all data points count equally with simple linear regression. 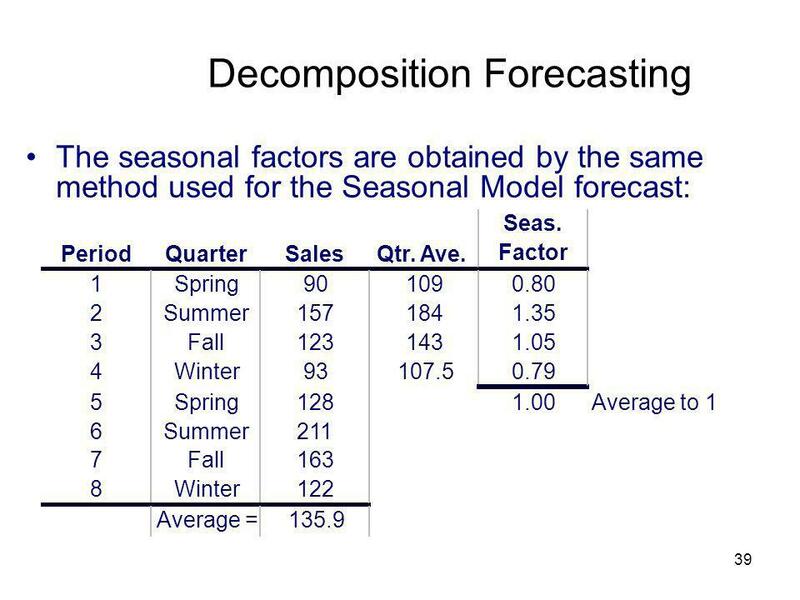 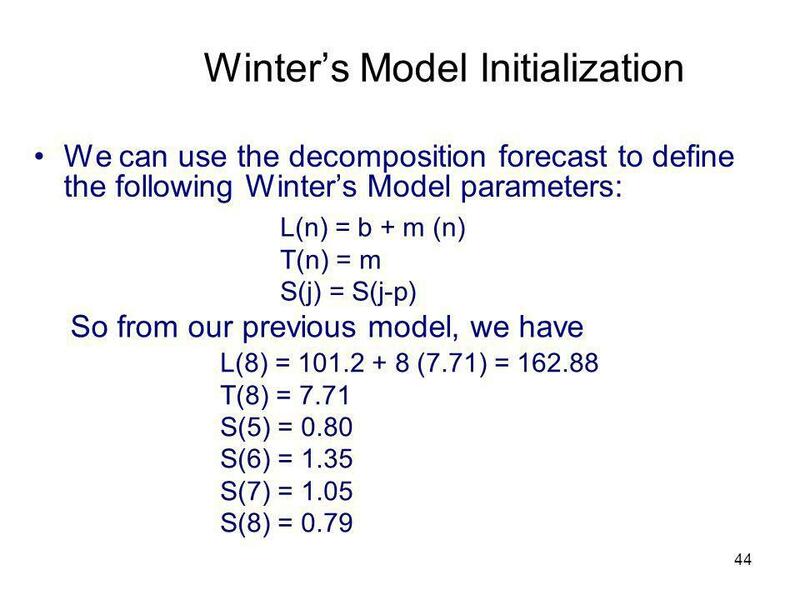 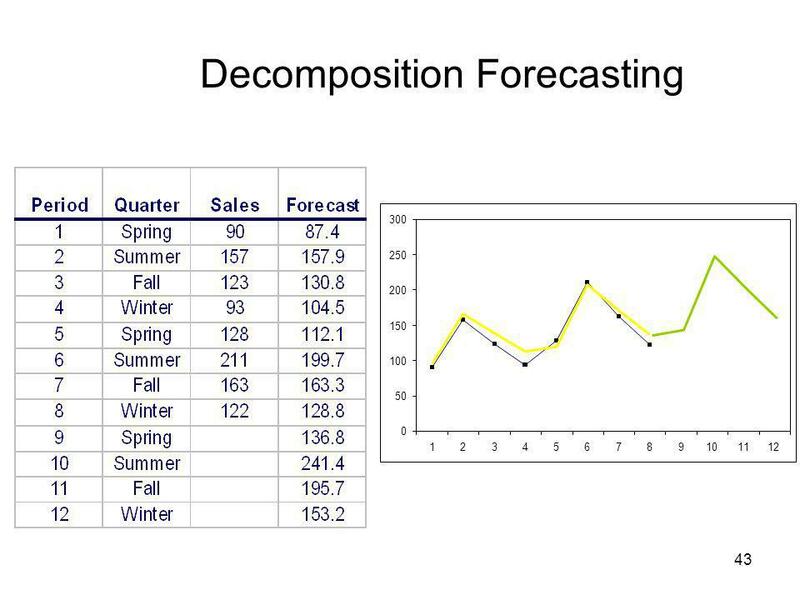 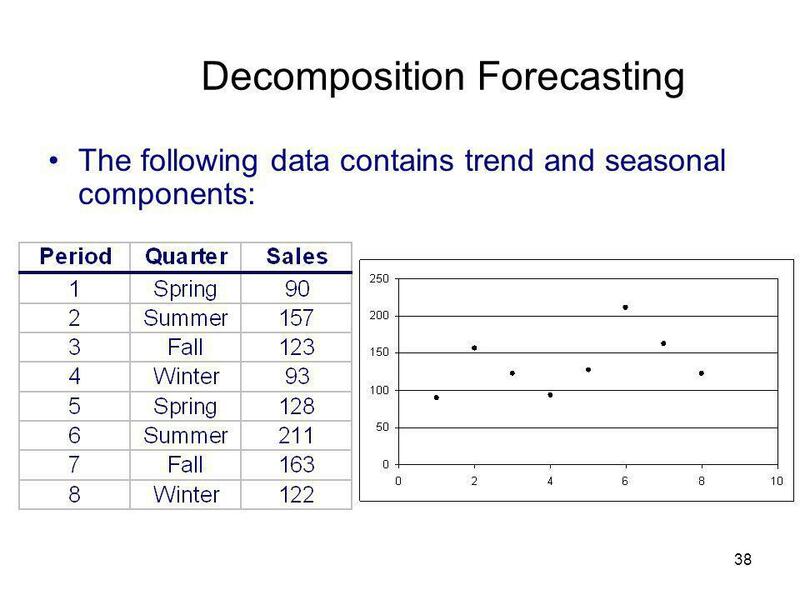 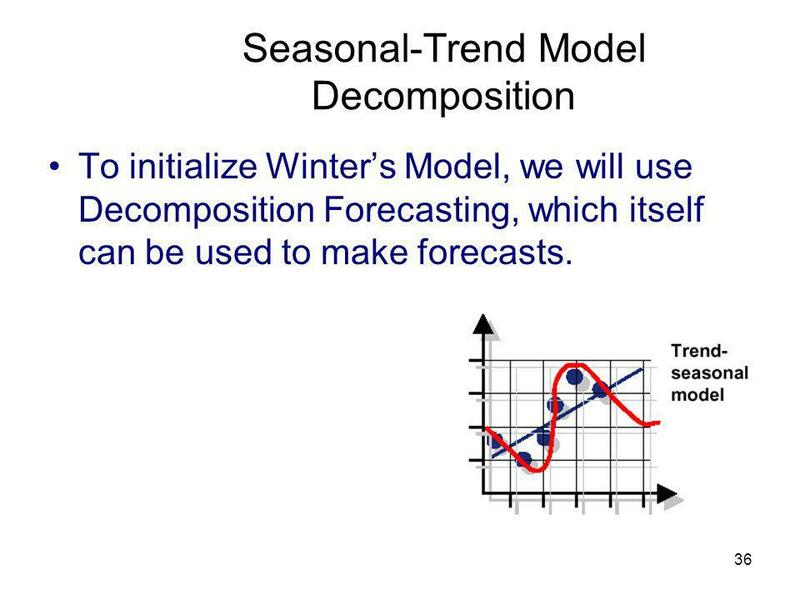 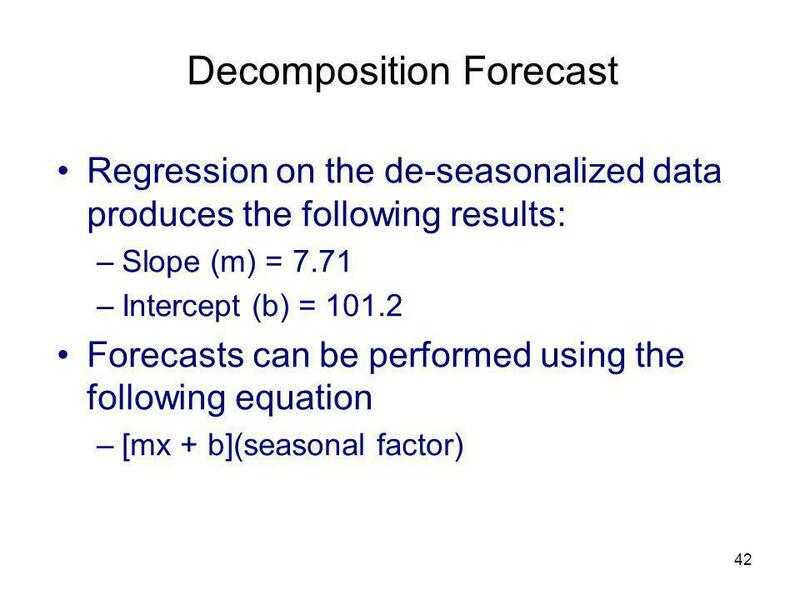 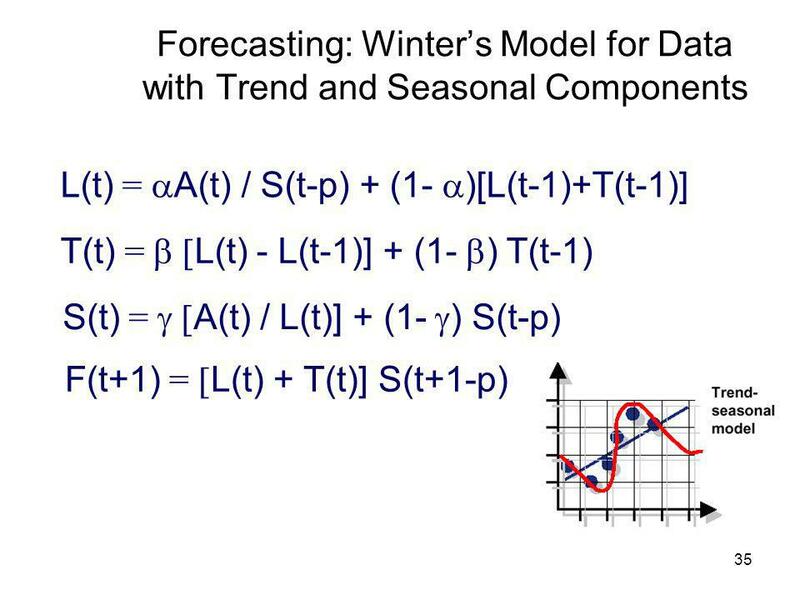 To initialize Winter’s Model, we will use Decomposition Forecasting, which itself can be used to make forecasts. 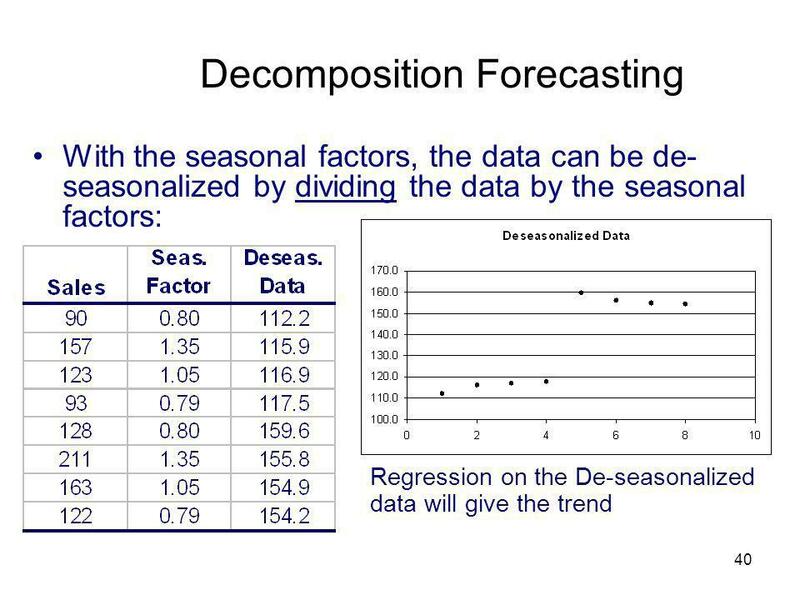 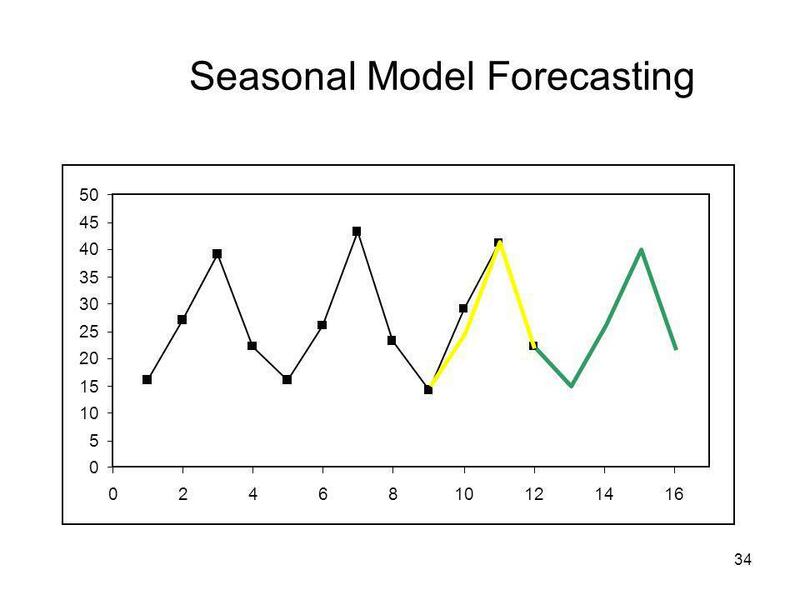 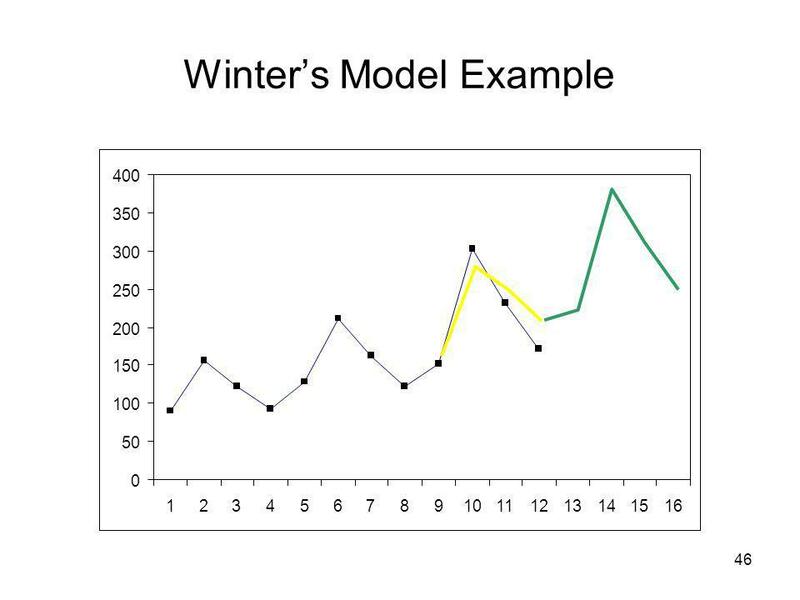 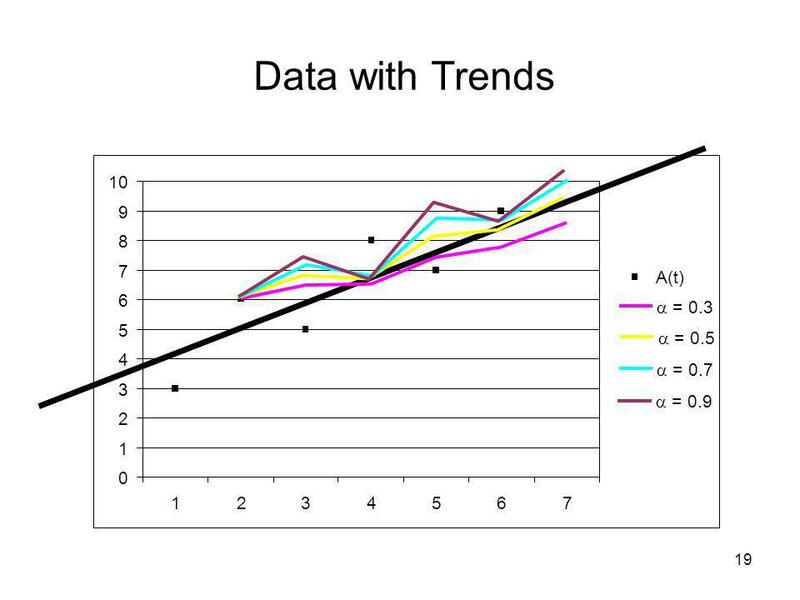 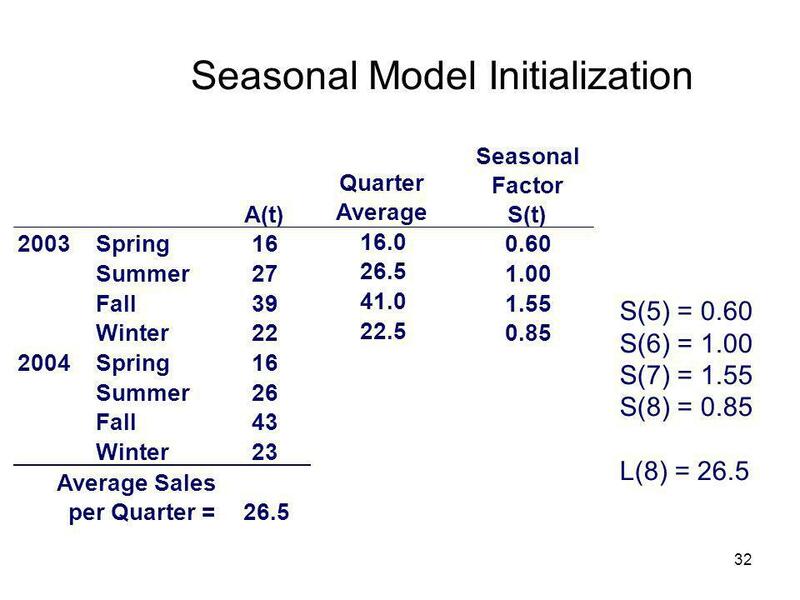 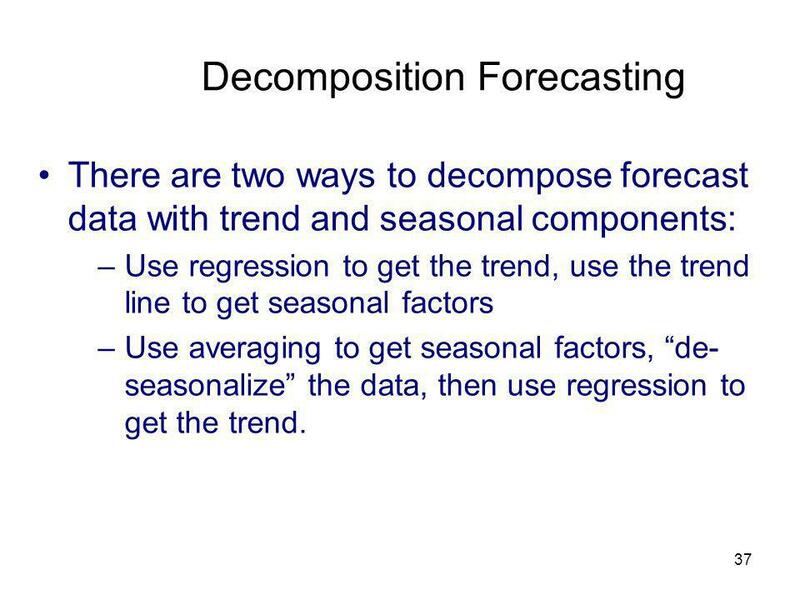 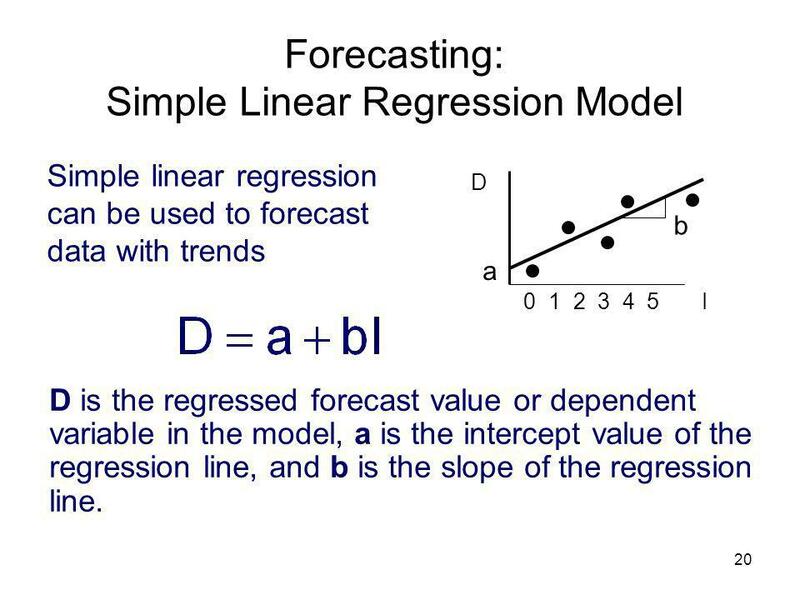 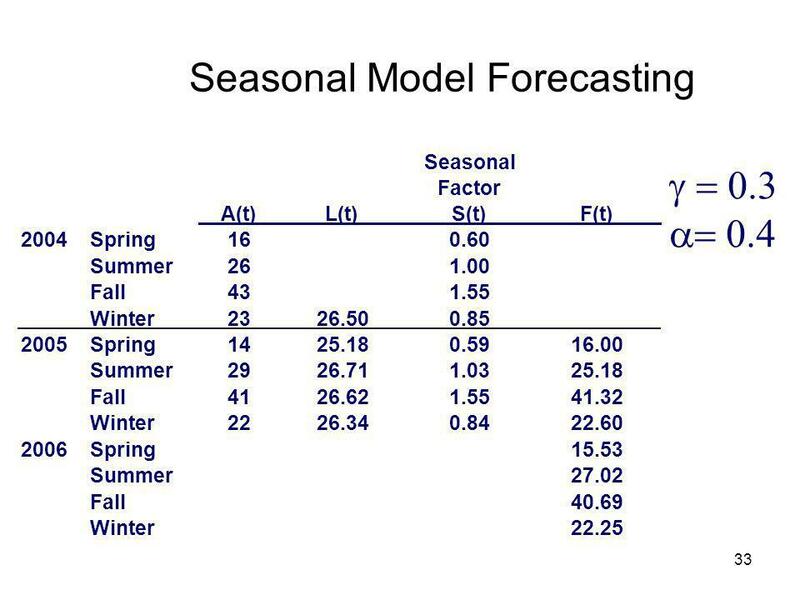 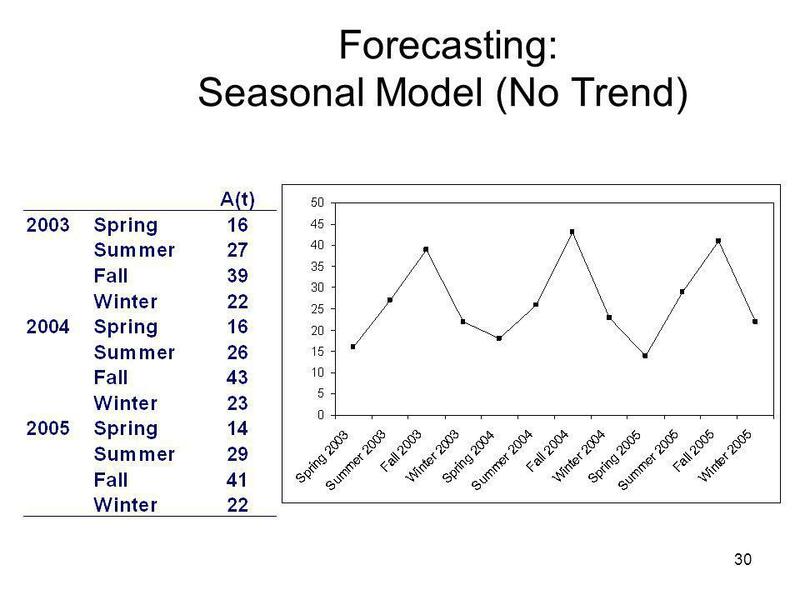 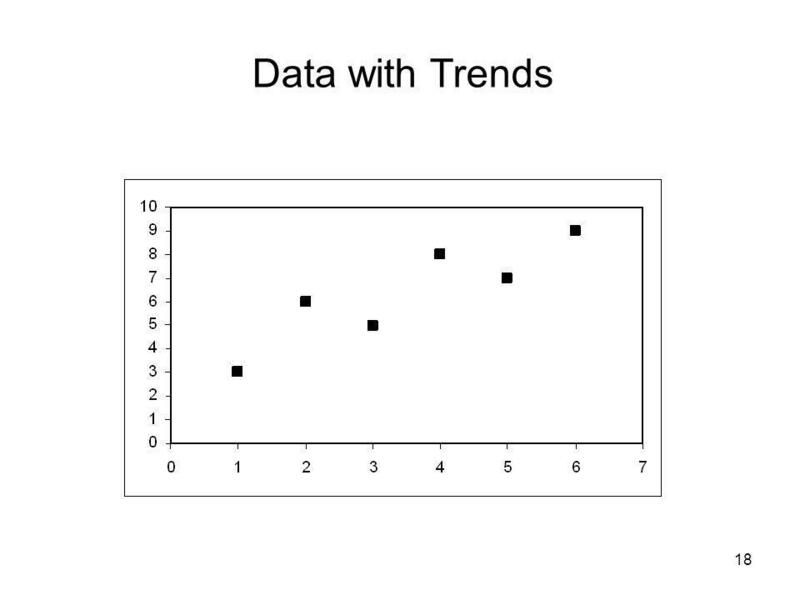 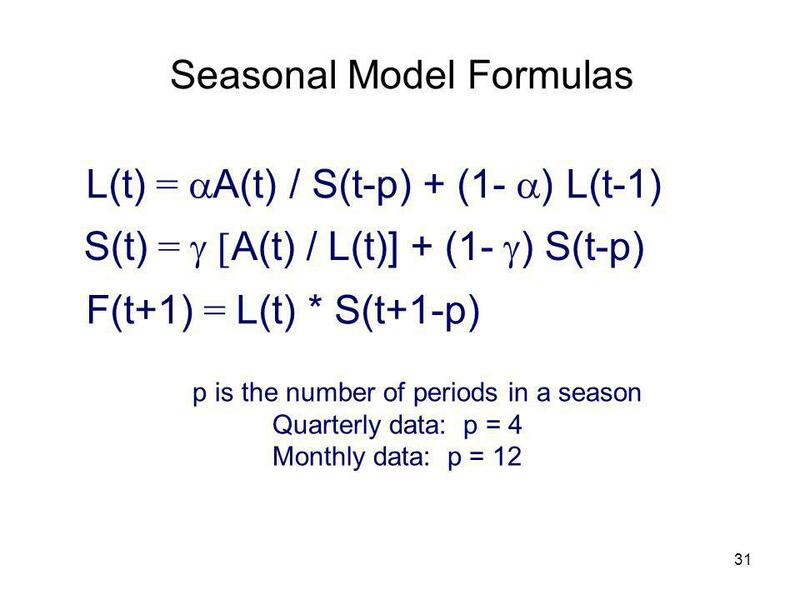 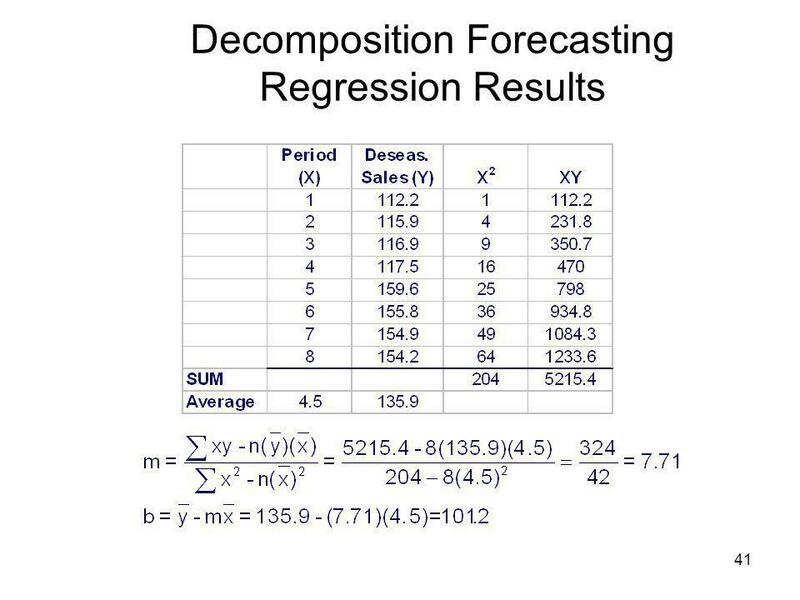 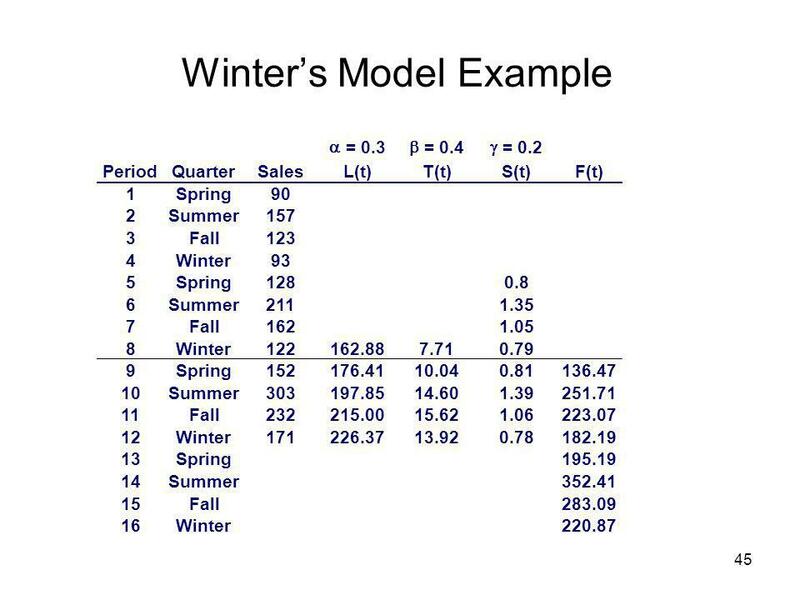 There are two ways to decompose forecast data with trend and seasonal components: Use regression to get the trend, use the trend line to get seasonal factors Use averaging to get seasonal factors, “de-seasonalize” the data, then use regression to get the trend. 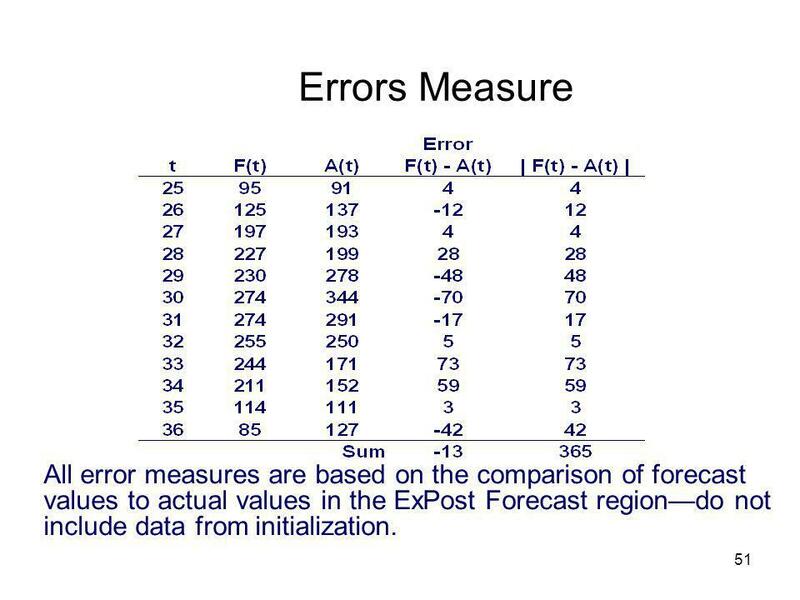 51 Errors Measure All error measures are based on the comparison of forecast values to actual values in the ExPost Forecast region—do not include data from initialization. 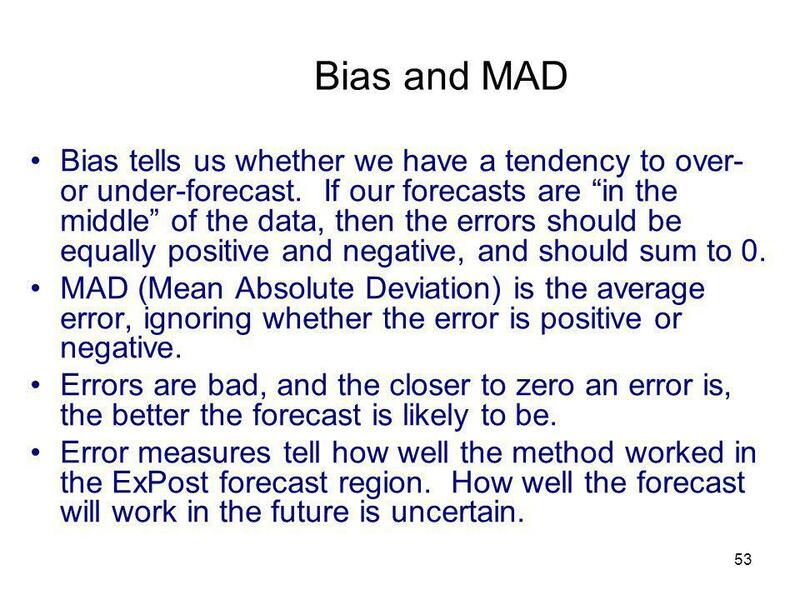 53 Bias and MAD Bias tells us whether we have a tendency to over- or under-forecast. 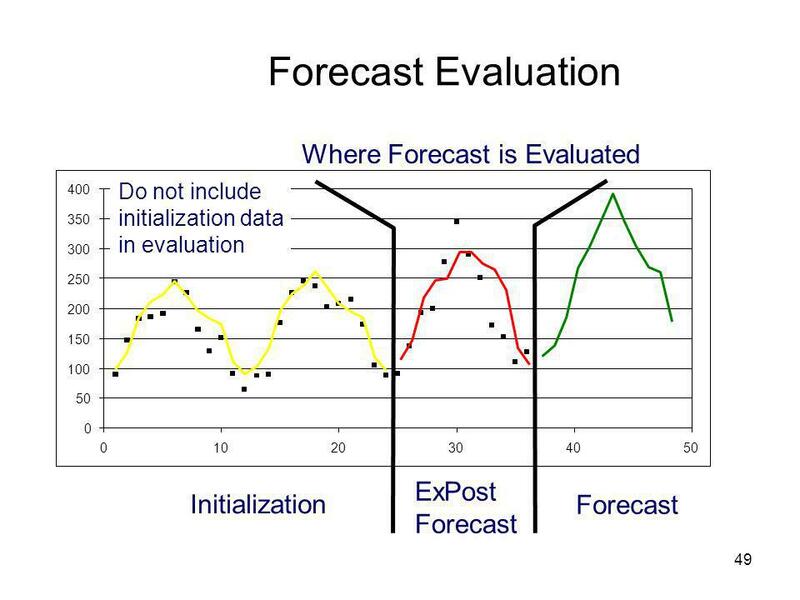 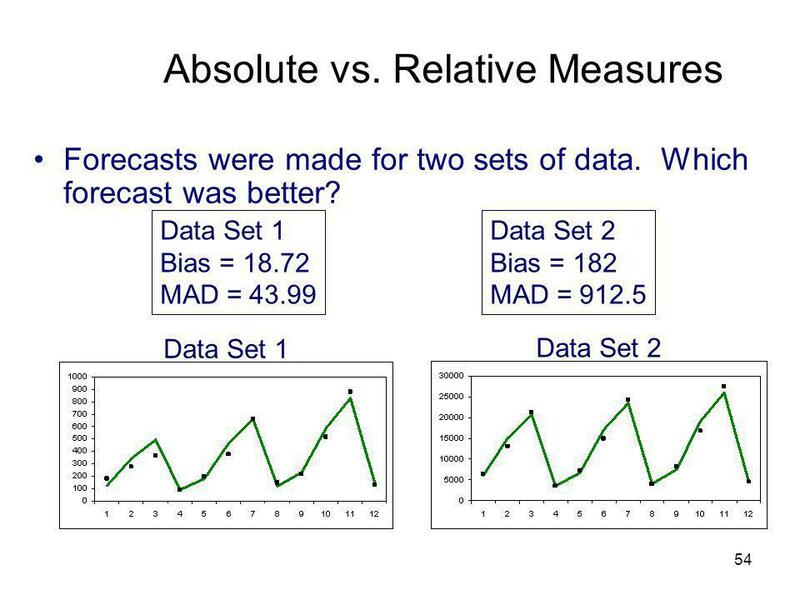 If our forecasts are “in the middle” of the data, then the errors should be equally positive and negative, and should sum to 0. 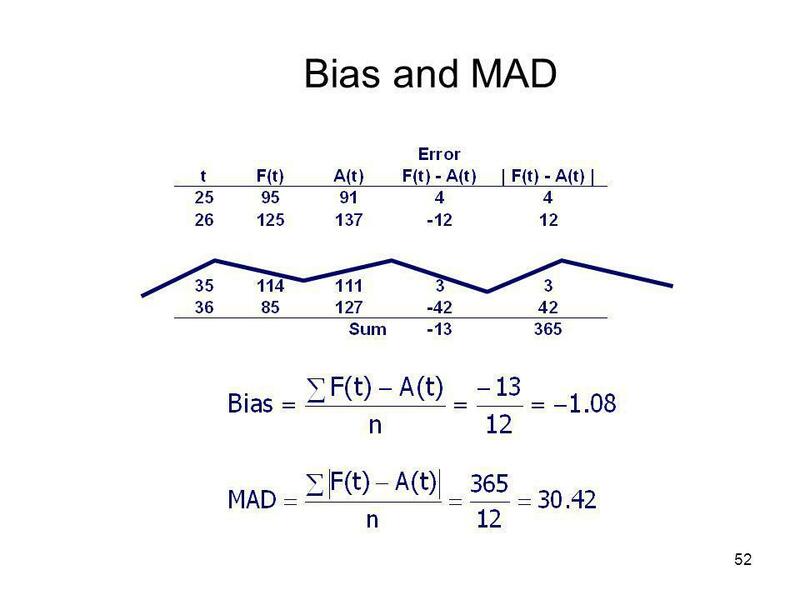 MAD (Mean Absolute Deviation) is the average error, ignoring whether the error is positive or negative. 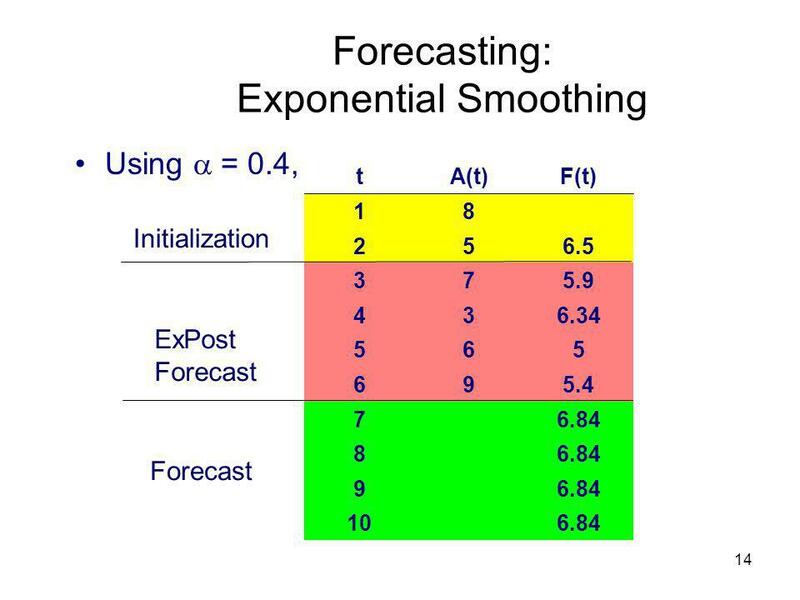 Errors are bad, and the closer to zero an error is, the better the forecast is likely to be. 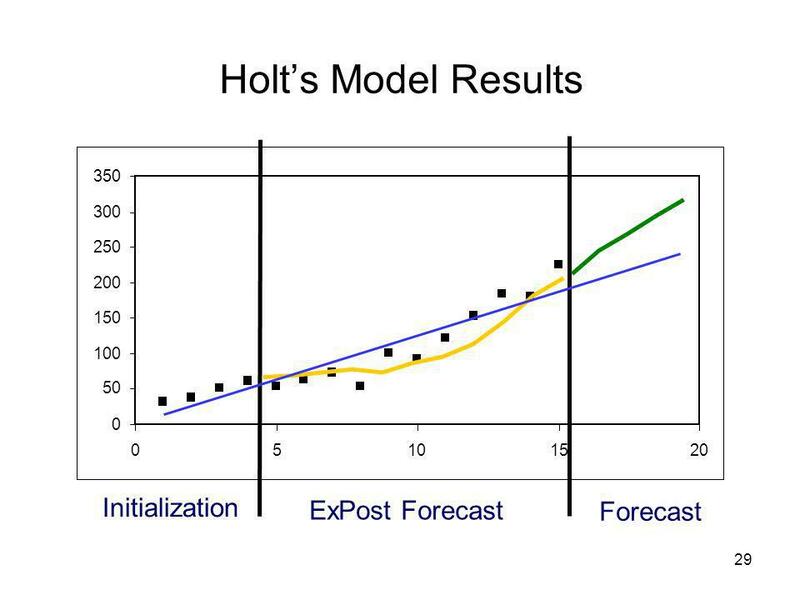 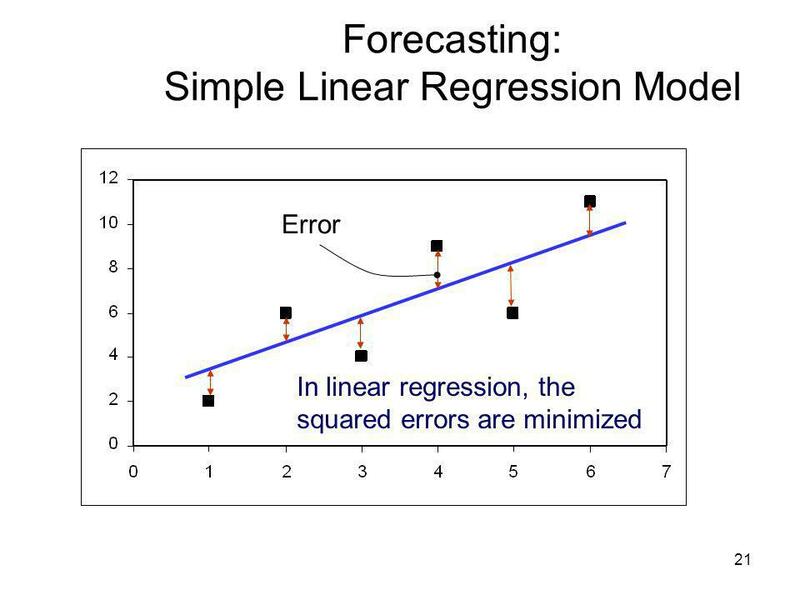 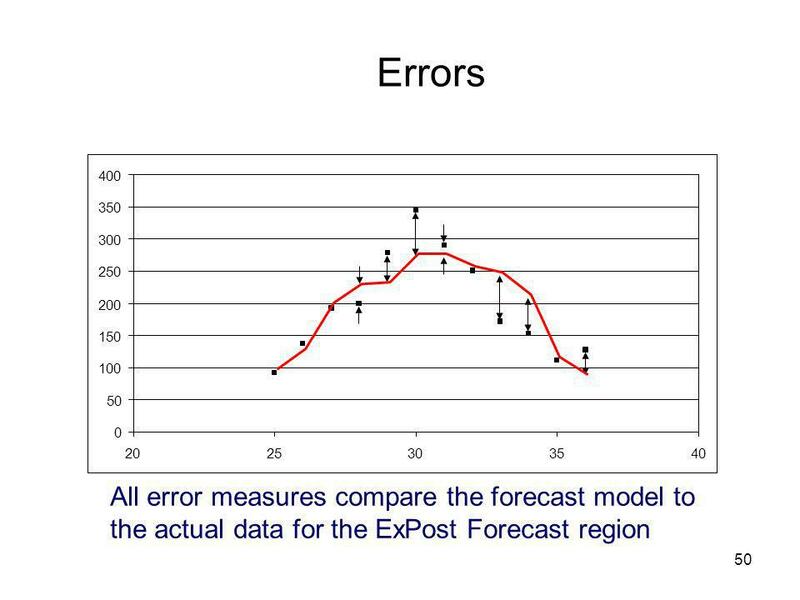 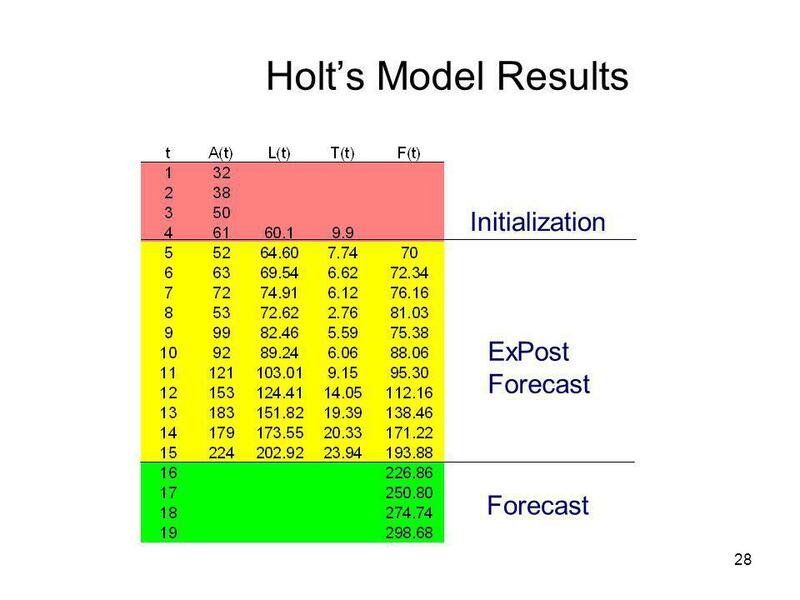 Error measures tell how well the method worked in the ExPost forecast region. 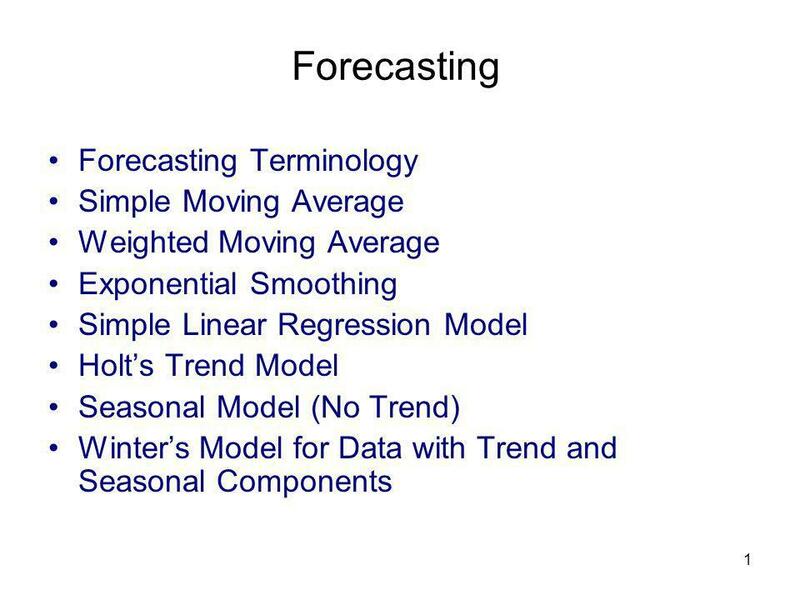 How well the forecast will work in the future is uncertain. 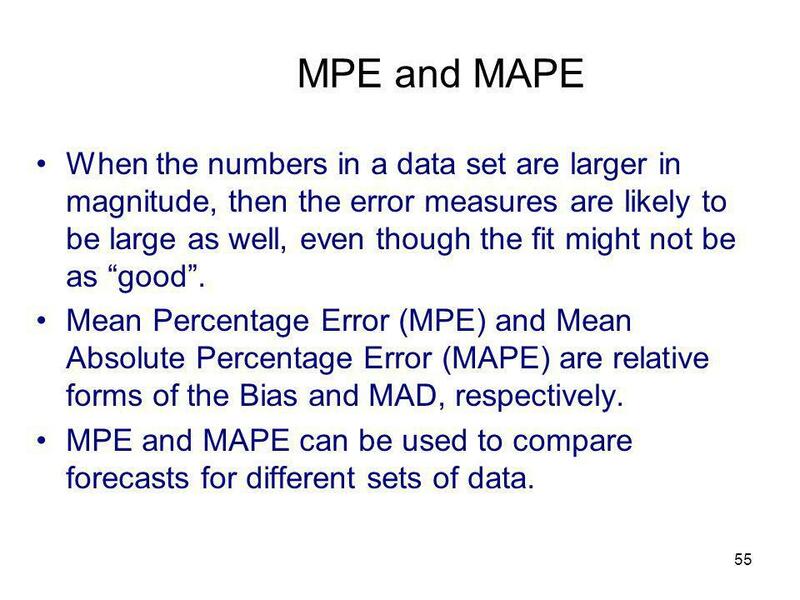 55 MPE and MAPE When the numbers in a data set are larger in magnitude, then the error measures are likely to be large as well, even though the fit might not be as “good”. 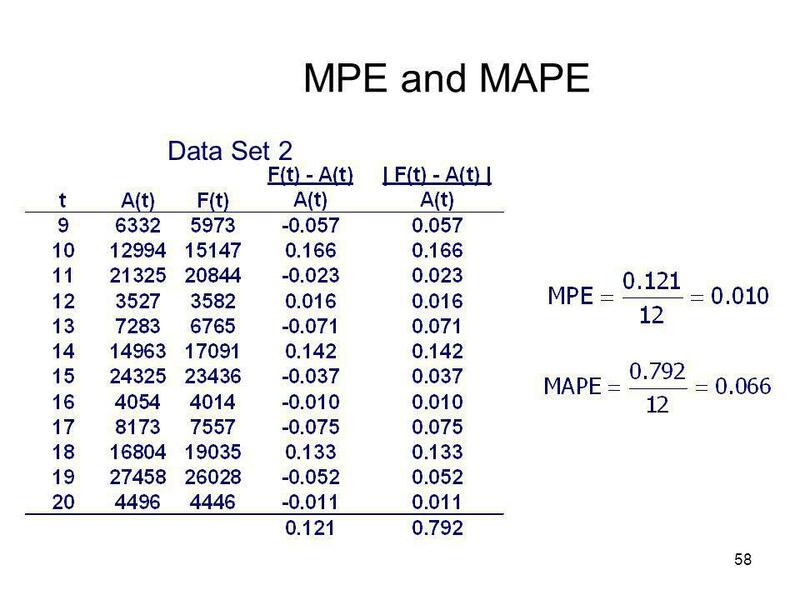 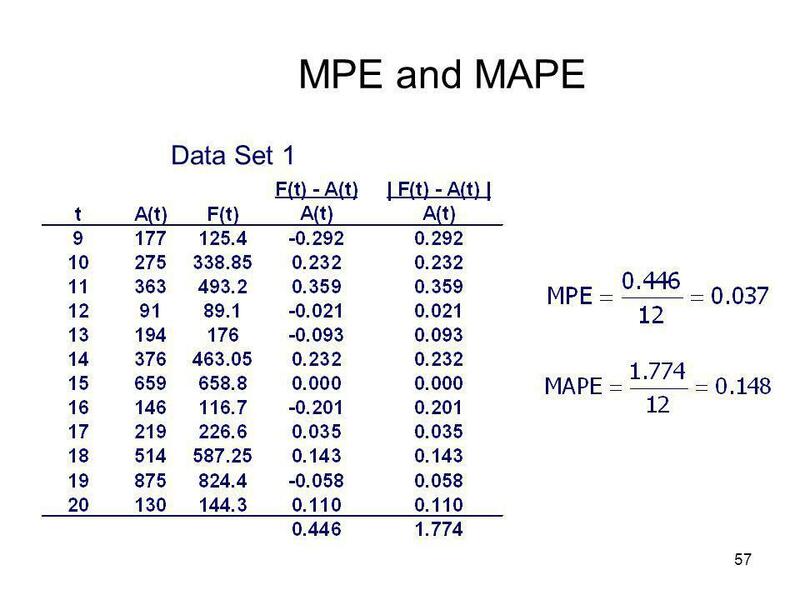 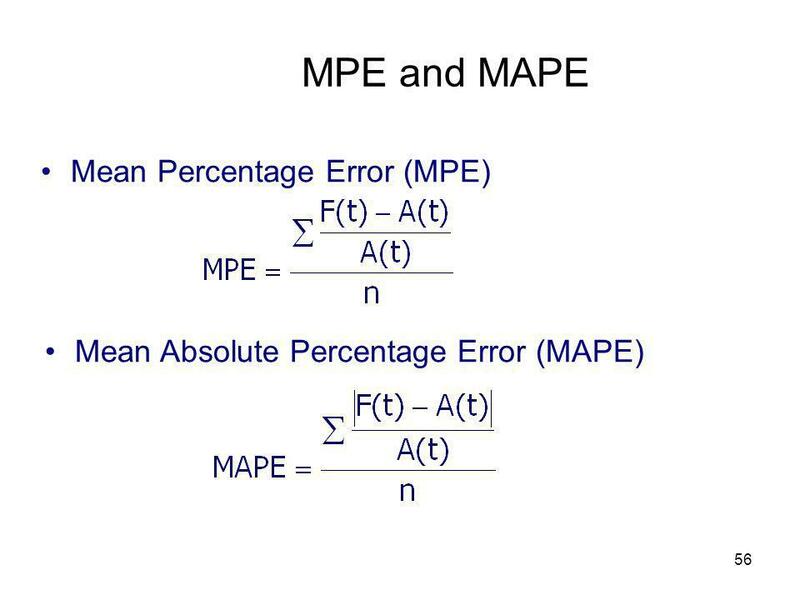 Mean Percentage Error (MPE) and Mean Absolute Percentage Error (MAPE) are relative forms of the Bias and MAD, respectively. 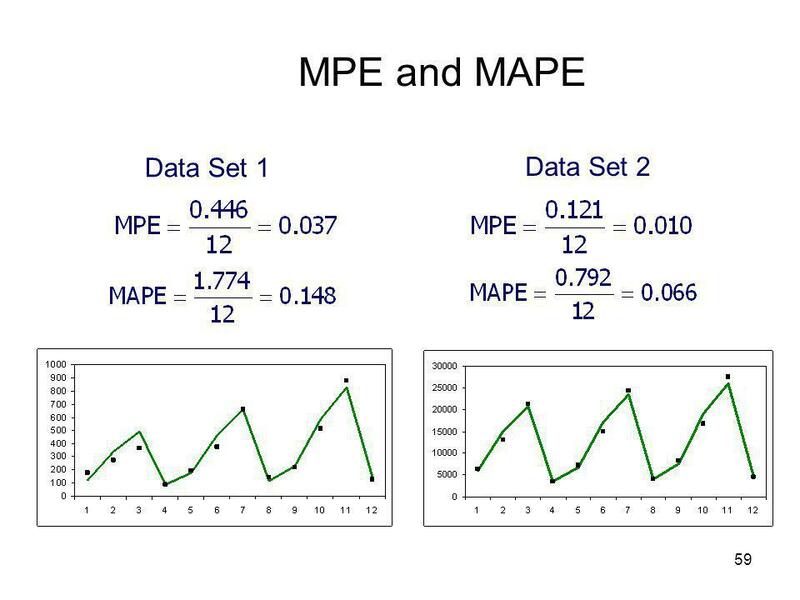 MPE and MAPE can be used to compare forecasts for different sets of data. 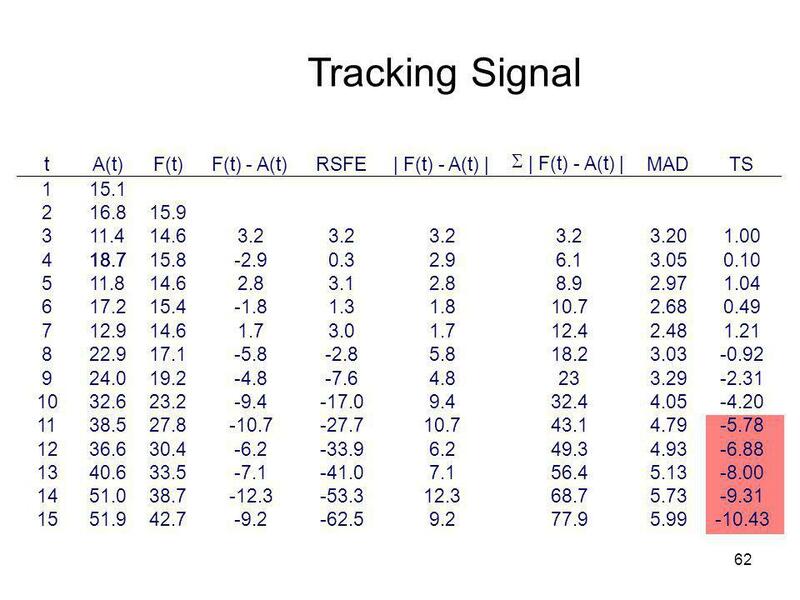 61 Tracking Signal The tracking signal can be calculated after each actual sales value is recorded. 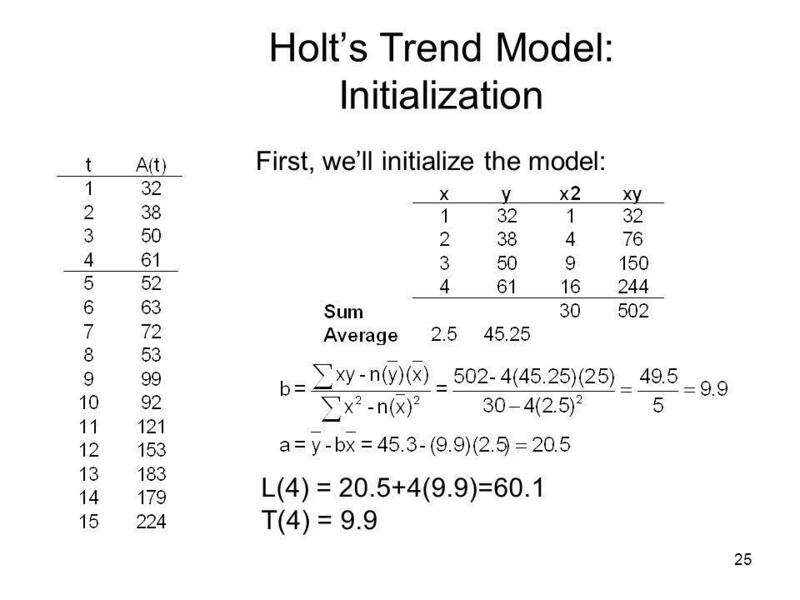 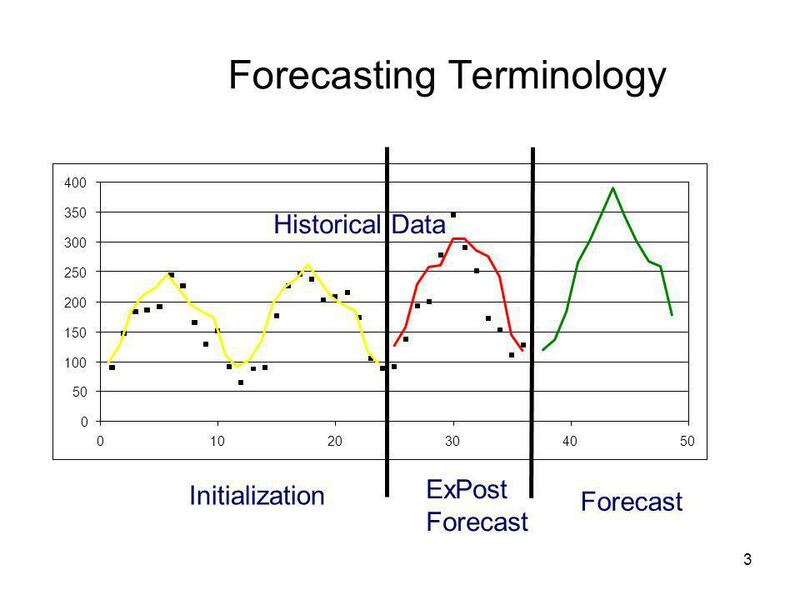 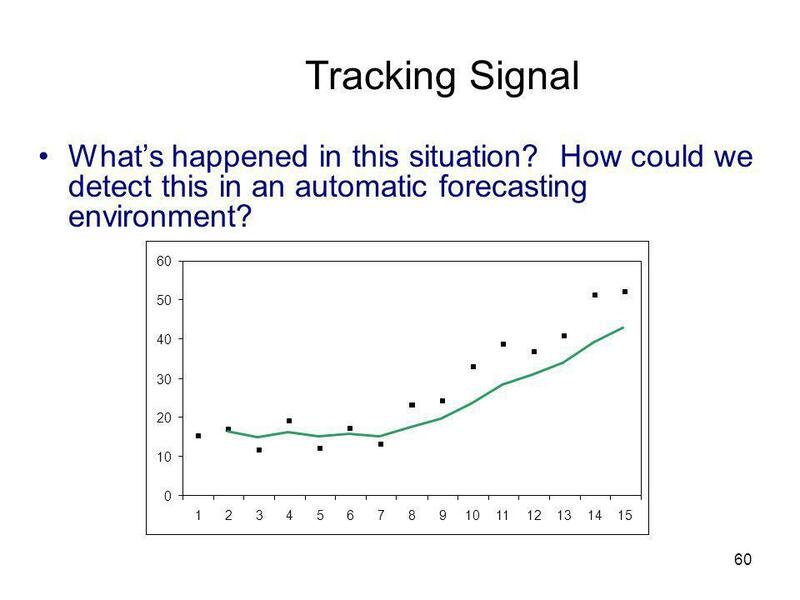 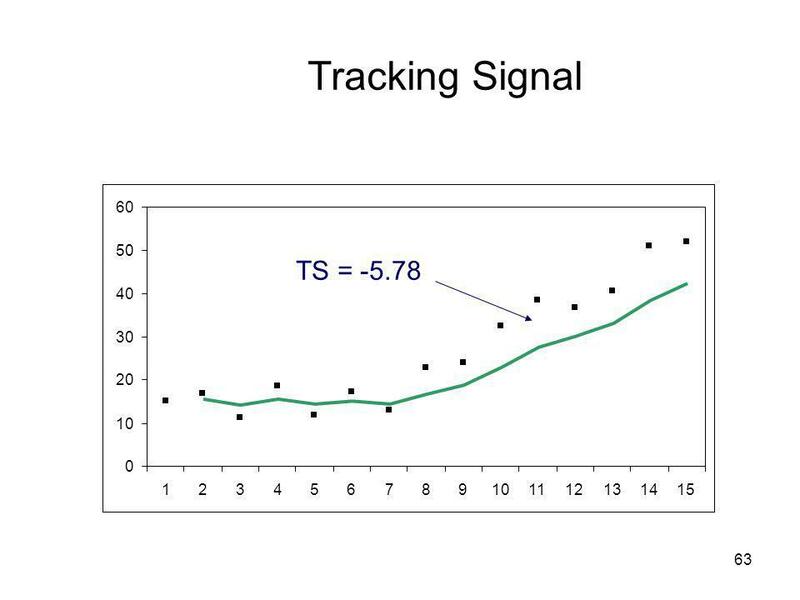 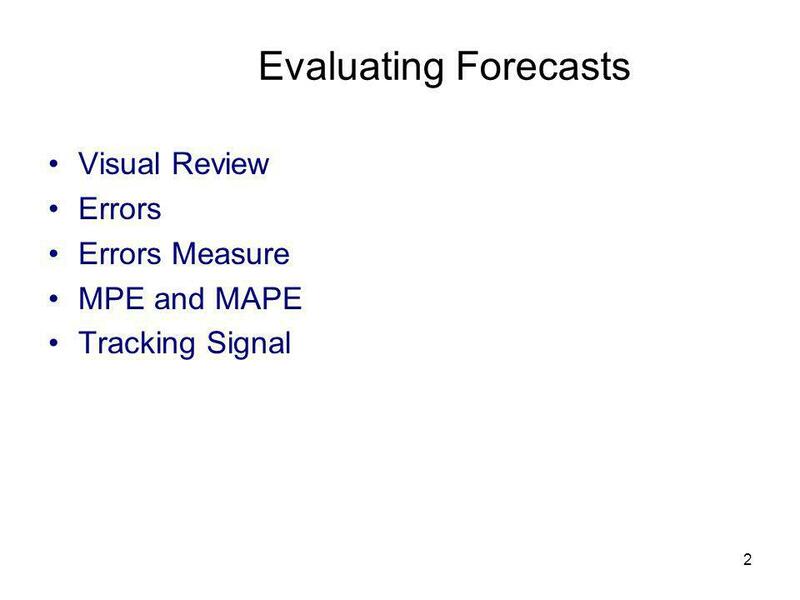 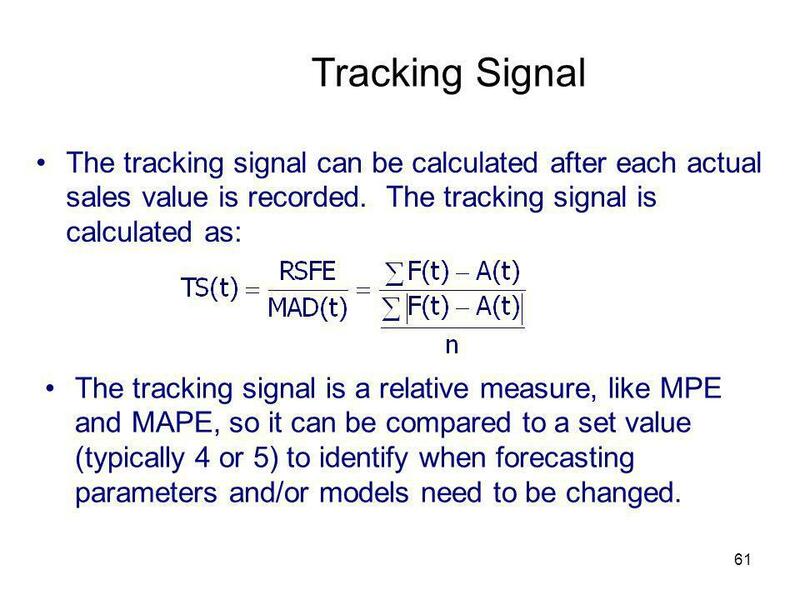 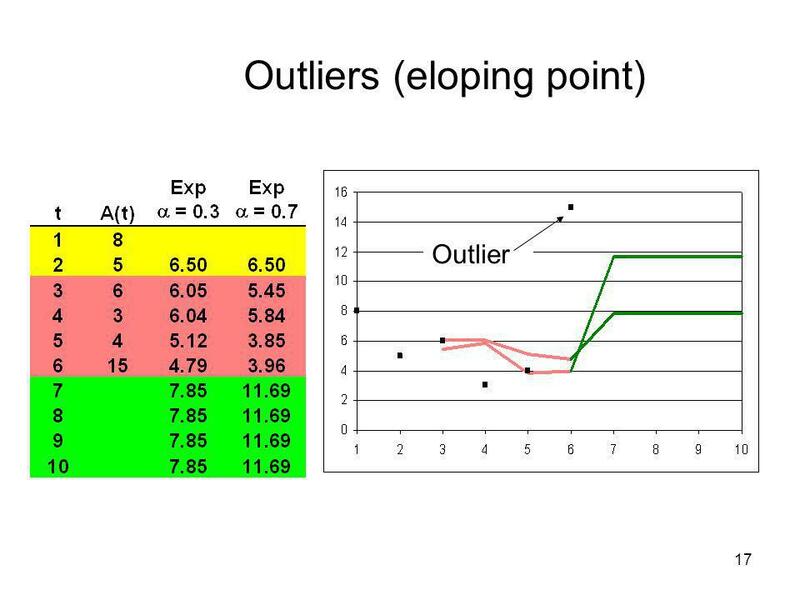 The tracking signal is calculated as: The tracking signal is a relative measure, like MPE and MAPE, so it can be compared to a set value (typically 4 or 5) to identify when forecasting parameters and/or models need to be changed. 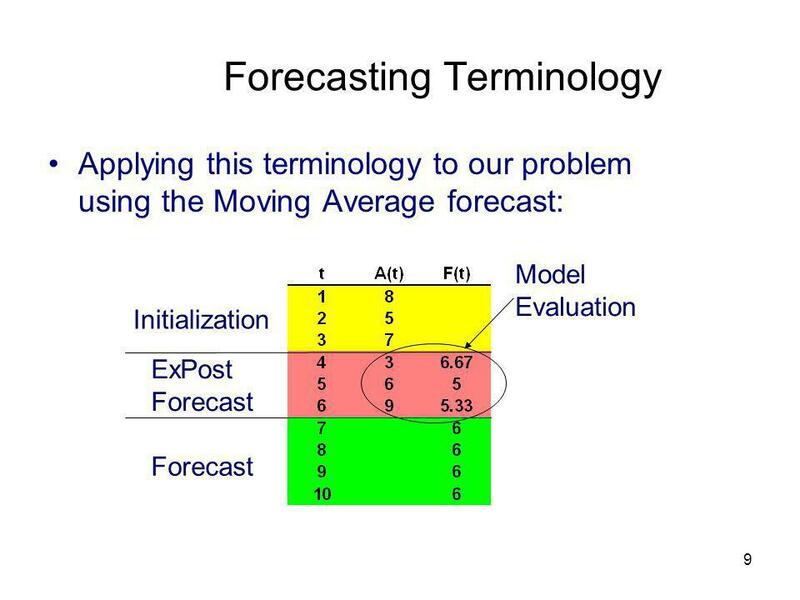 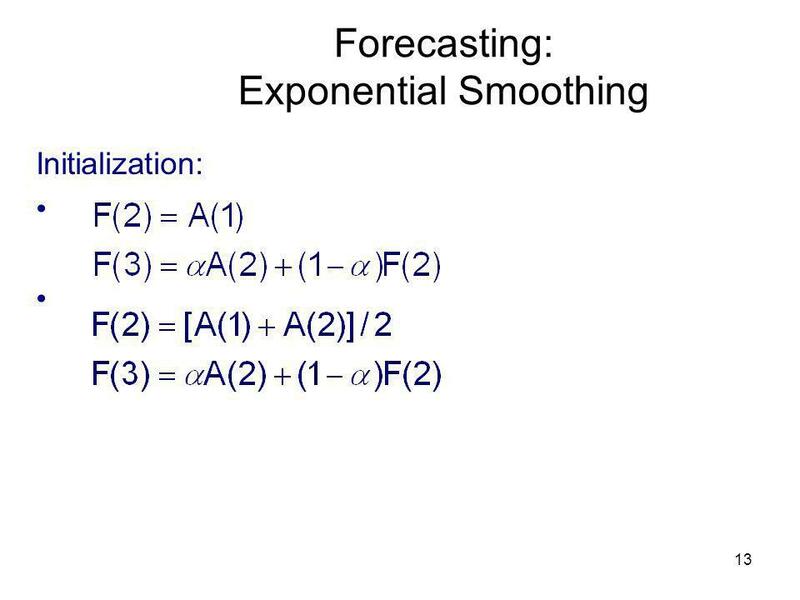 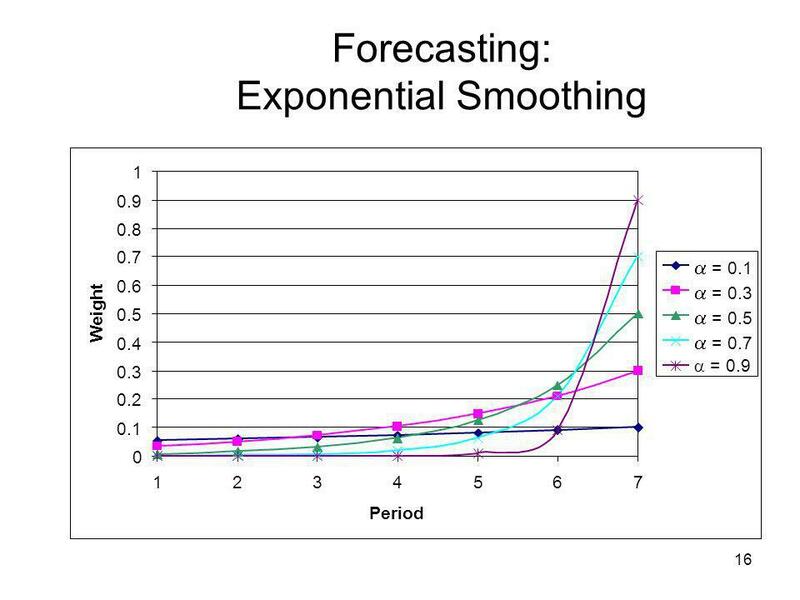 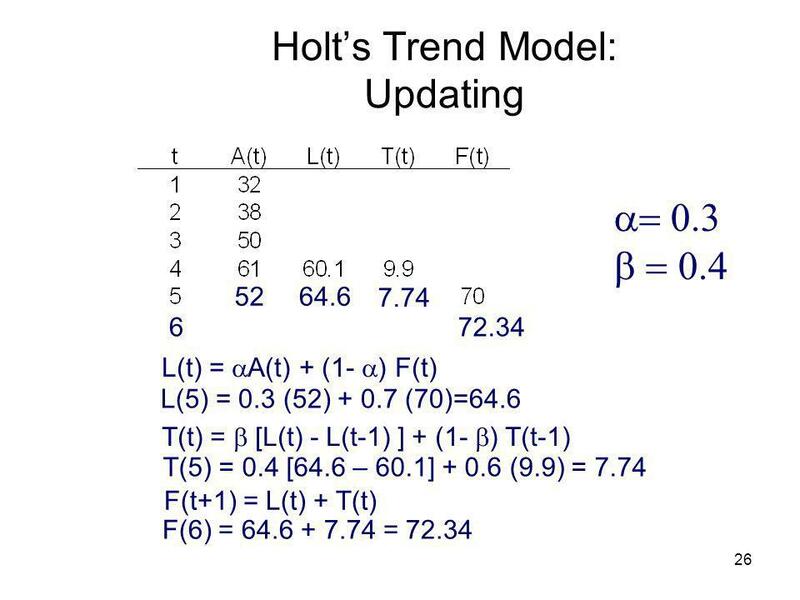 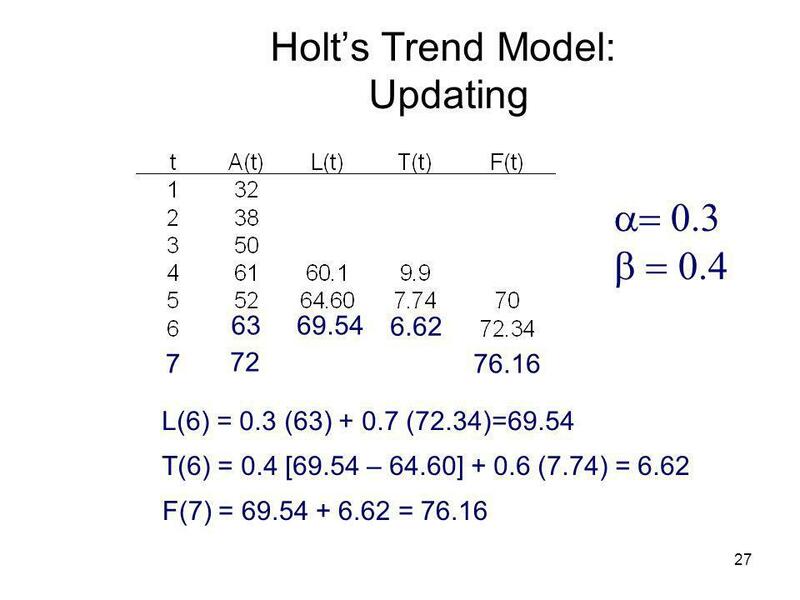 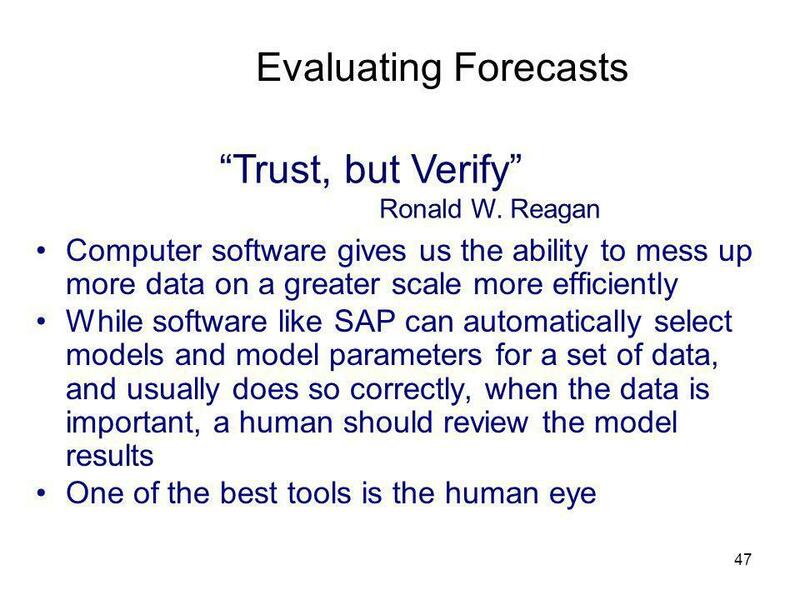 Download ppt "Forecasting Forecasting Terminology Simple Moving Average"